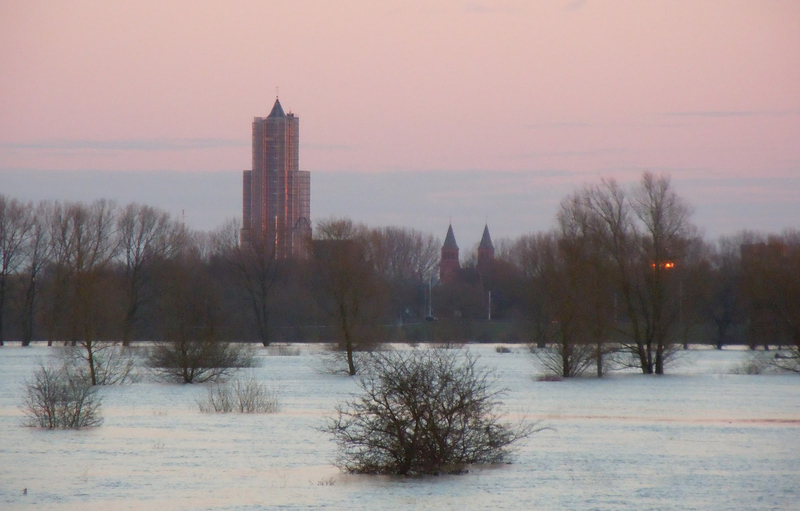 Stadsblokken and Meinerswijk are areas within the floodplains of Arnhem. It is a dynamic area with nature, recreation, archeology, agriculture, urban development, soil pollution and water issues. After an intensive participation program, Bureau B+B composed a master plan combining the range of interests. 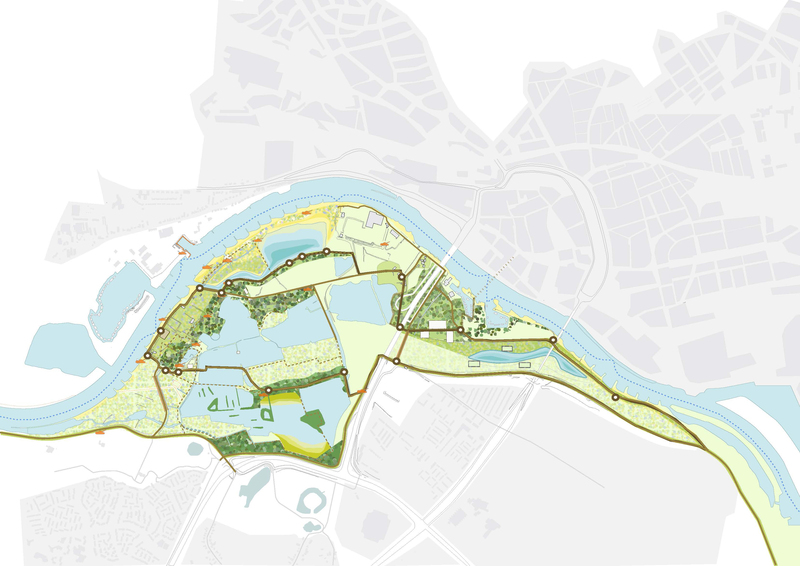 Stadsblokken-Meinerswijk covers 450 ha of floodplains on the south bank of the Nederrijn River, just opposite of Arnhem’s city centre. When the water is high, approximately two thirds of the area floods. 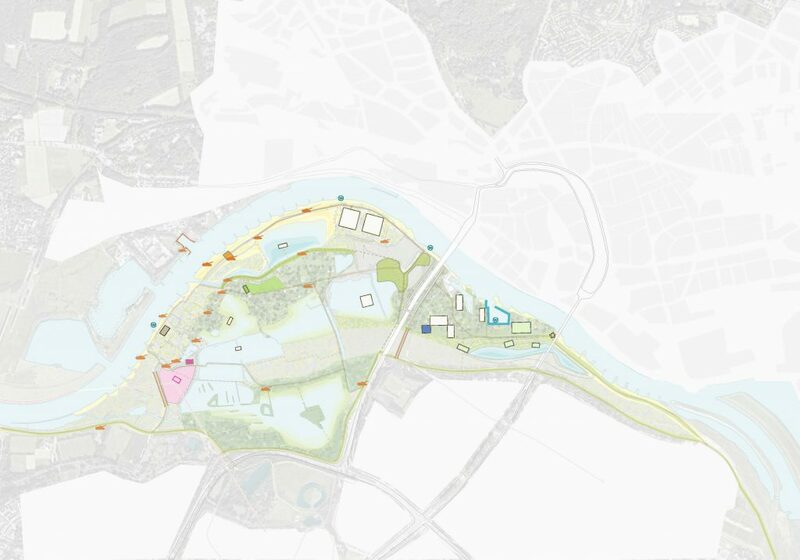 The master plan is based on the idea of an extended, rugged floodplain park, giving a larger amount of space to the river. The ecological objective is aimed at developing a river valley with swamp and water vegetation. 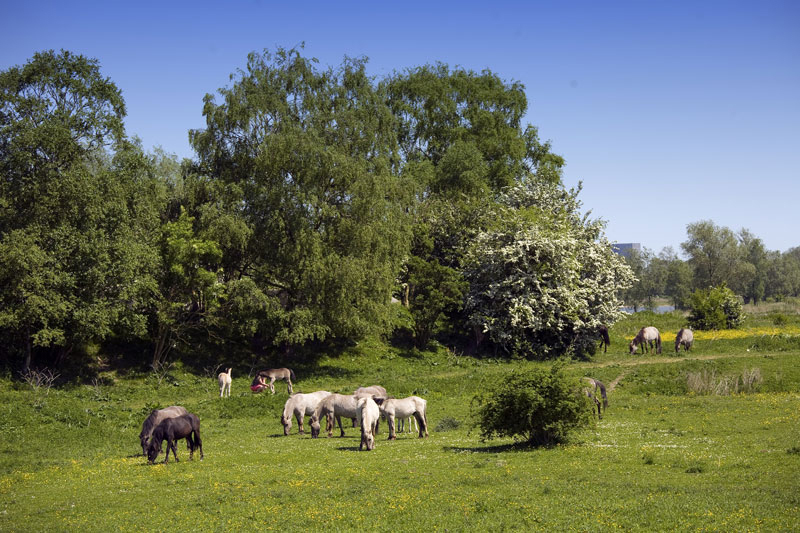 The river dynamics and the pure seepage water offer opportunities for a range of biodiversity. To increase the dynamics and speed up water discharge, parts of the dike were removed. River water can now flow into Bruil’s Pond, a newly dug gully permanently holding water. When the water is high, river water can quickly be discharged through the gully therefore preventing dike breaches and floods. Many interests are at stake in this dynamic area. Therefore, the process started with open participation sessions, resulting in nine mindsets. Based on these mindsets, Bureau B+B created three scenarios, that were tested by all parties involved. 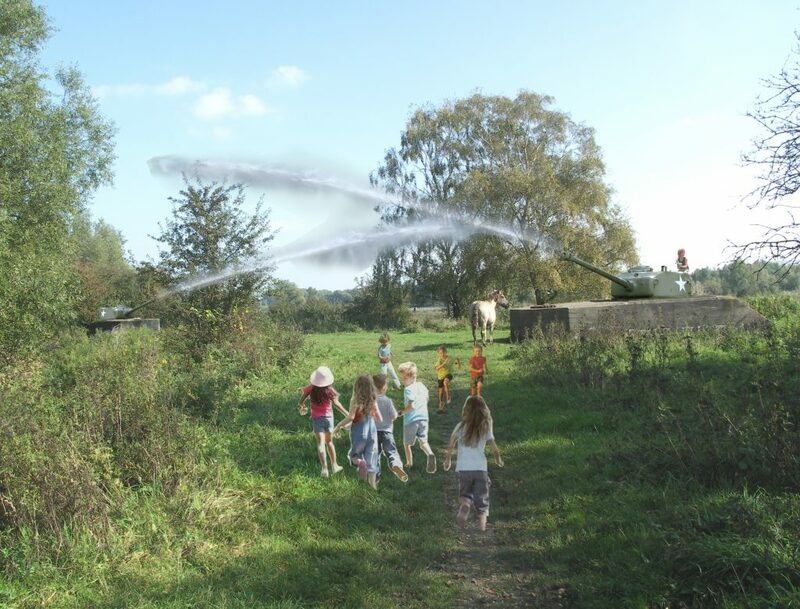 Besides Rijkswaterstaat, the Provincial government, State Forestry and the water board, were also involved in the process. Other stakeholders, such as land owners and neighbors, were constantly informed and consulted. During three public meetings, the results, scenarios and concepts, were shared with the public. 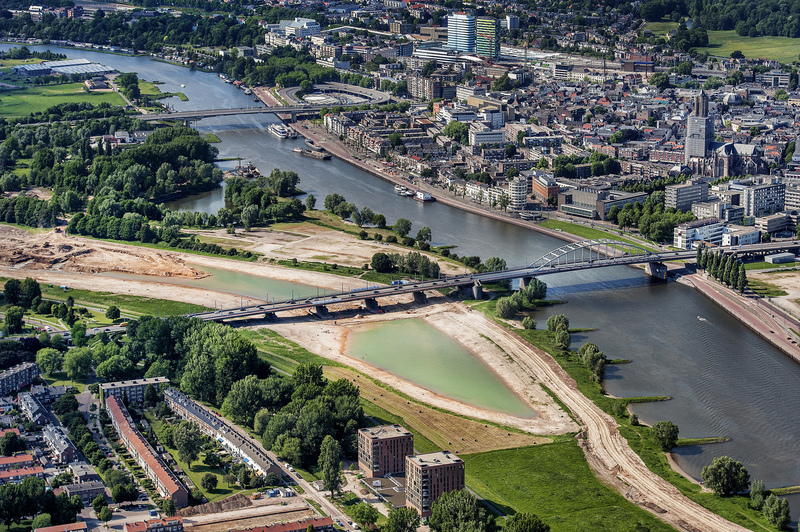 The floodplains contain remnants of an old Roman fortress, a medieval farmstead, a seventeenth century canal, a shipyard and a military defense line. In the master plan, all the historical values are mapped out. Consequently, Bureau B+B made recommendations for the enhanced experience of history. Several historical objects can be reused, like the stone factory, an old café and the shipyard. In addition, there are plans for a Rhine Chamber, with an overview of the river´s history. Next to the John Frost Bridge there are opportunities for a freedom monument. All the historical objects are connected by a comfortable pathway. When the water is high, approximately two thirds of the area floods. The ecological objective is aimed at developing a river valley with swamp and water vegetation. Bureau B+B composed a master plan, combining all different interests. All the historical values are mapped.